Bombardier released its first Sea-Doo personal watercraft in 1968 but found little success on the market. It was brought back as its own brand under Bombardier 20 years later and has maintained a position at the top of the PWC industry. We're honored to carry a large inventory of Sea-Doo OEM parts to help you find the options you need to get your watercraft repaired and back out on the water. 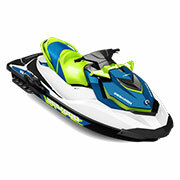 Spanning over 20 years of Sea-Doo models, we have the right parts for your specific watercraft. When you buy OEM, you're choosing parts made by Sea-Doo specifically for their watercrafts, so you'll always get a perfect fit. If your Sea-Doo is from 2010 or later, we offer everything you need for your watercraft. Whether you own an RXP 300, GTI 90, Wake 155, or RXT 215, we can accommodate what your model needs to be operable again. From common to more complex repairs, you can find exactly what you need with us. From the cooling system and exhausts to vehicular bodies and hulls, we have it all! Your Sea-Doo may have been manufactured in 2009 or somewhere in the early 2000s. Regardless, we've got the options you've been looking for to get your watercraft running as it was when you bought it. We stock parts for them all, including the Wake 155, GTX LTD, XP DI, and LRV 5688. From starters and fuel systems to seats and air intakes, our inventory of Sea-Doo OEM parts can take care of your repair needs. No matter what your model needs, we've got the parts to restore it. If you happen to have a classic Sea-Doo from 1996 to 1999, we offer OEM parts for these, too! If your model has been sitting in the garage or storage, we can help get it back to working order. Whether you have the GTX RFI 5887, SPX 5839, HX 5882, or SPI 5878, we can fulfill all of your part requirements. From oil pumps and electrical boxes, to oil injection systems and crankshafts, we carry everything your Sea-Doo needs to be a fully functional watersport vehicle again. Whatever type of Sea-Doo parts your model needs, we have them in stock.